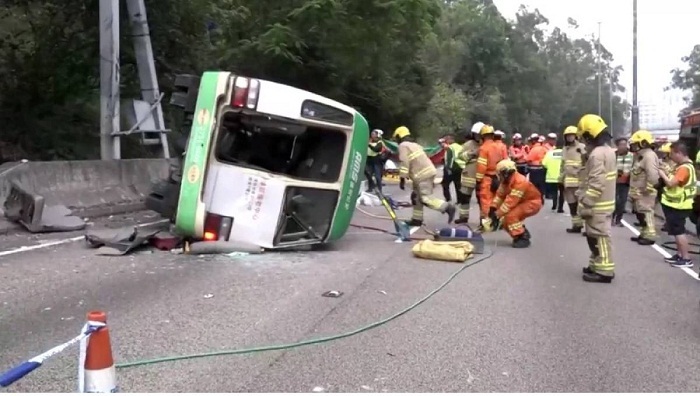 The driver of a minibus died and 16 passengers were injured after the vehicle they were traveling in flipped and crashed onto a boundary wall in China's Hong Kong Special Administrative Region on Monday morning. The accident happened at around 8:30 a.m. on Shing Mun Tunnel Road and the vehicle was heading towards Sha Tin of Hong Kong's New Territories. None of the passengers suffered serious injuries and they were sent to hospitals.